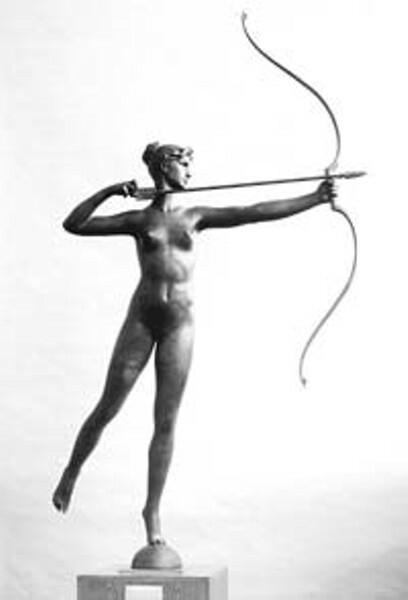 Memorial Art Gallery She once hovered above us: Saint-Gaudens bronze Diana. Does art have to have meaning? Does it need to be spiritually uplifting, morally challenging, and politically provocative? Does art have to have a purpose? It's an age-old debate, but a new exhibition at the Memorial Art Gallery, highlighting the work of American sculptor Augustus Saint-Gaudens, offers a response to the schism between beautiful purpose and purposeful beauty. On view are 68 of the artist's most famous works in bronze, plaster, and marble. The exhibit includes full-size sculptures, models for monumental public commissions, Renaissance-style relief portraits, decorative objects, and rare US coins. Saint-Gaudens' art does indeed have a purpose: It allows us to contemplate the beautiful while reveling in the visual pleasure of the work itself. Contemplation of the beautiful and the beauty of classical form are characteristics of the Renaissance. It is appropriate that Saint-Gaudens, who has been hailed as the "American Michelangelo," came of age in an era wracked and divided by the horrors of the Civil War. Saint-Gaudens was born in Ireland in 1848, and moved to America with his family six months later. In 1867, with the support of his parents (and all their savings), Saint-Gaudens traveled to France, and later to Rome, to study art. What he saw in Europe --- from the academic realism of French painter Jean-Léon Gérôme (whose 1875 Interior of a Mosque is in the MAG's collection) to the classically inspired sculptures of Donatello and Michelangelo --- combined with his memories of America at war. Saint-Gaudens was convinced that America was the place for art. And his varied experiences culminated in a body of work that became uniquely American. He is to be credited for precipitating the reawakening of the sculptural medium in America at a time when the American and French art worlds were dominated by painting. Prior to the Civil War, there was a significant increase in the number of private art collectors in New York City. Between 1825 and 1861, the population of New York City more than quadrupled, and a relatively small but prosperous group of landholders, merchants, manufacturers, bankers, lawyers, and doctors emerged. Saint-Gaudens began to receive commissions from this group when he returned to New York City in 1875. His early commissions were for decorative works such as cameos, murals, sculpted panels, stained glass, and silver. He produced the medallions that encircle the upper portion of the stunning neo-classical Bryant Vase, executed in 1875 for Tiffany and Company. Each medallion includes scenes from the life of William Cullen Bryant to whom the original silver vase was presented. On view at the MAG is a copy --- the original resides in the collection of the Metropolitan Museum of Art in New York City. While in France, Saint-Gaudens was also introduced to late 19th-century modern art. In particular, he was exposed to Art Nouveau, a decorative style that reflected the combined influences of European and Asian art. The powerful stylistic effect on Saint-Gaudens' work is apparent in the gracefully flowing lines of the carved reliefs seen in the base of the Farragut Monument (1881) -- the first of a number of Civil War monuments. (Represented in the MAG's exhibition is the model for the commission and a photograph of the finished bronze in situ.) It may be the first use of the Art Nouveau style in American sculpture. The Shaw Memorial (1884-1897) also exhibits the lyrical lines of Art Nouveau, seen in the angel floating above the infantrymen. The monument also reveals the sculptor's profound sensitivity for his subjects. Shaw was a colonel in the Union Army and the son of abolitionists. He commanded the first unit of African-Americans, and died with many of his men in 1863. Saint-Gaudens wanted to emphasize the nobility of the soldiers rather than adhere to stereotypes of the day. So he changed the original composition from a single equestrian portrait of Shaw to include the infantrymen as well. On view at the MAG are the model heads of five of the 23 soldiers Saint-Gaudens modeled from life. Saint-Gaudens created art that has become a part of the landscape. Though art like his is often all around us, we seldom stop to consider it. I didn't even know until recently that the great gilded equestrian statue keeping vigil over New York City's Central Park was the monument to General Sherman by Saint-Gaudens. Nor did I pay attention to his Farrugut Monument in Madison Square Park. His Diana, an 18-foot bronze statue, once crowned Madison Square Garden --- not unlike our own Mercury atop the Aqueduct building. Take a good look around: You never know what you might be missing. Speaking of what you might be missing: After you've spent some time with Saint-Gaudens, don't forget to look for a contemporary contribution to the American art scene. Philip Guston's painting Reverse recently came to the MAG on long-term loan. Augustus Saint-Gaudens: American Sculptor of the Gilded Age is on display at the Memorial Art Gallery, 500 University Avenue, through April 11. Hours: Tuesday 12 to 4 p.m., Wednesday and Friday 10 a.m. to 4 p.m., Thursday 10 a.m. to 9 p.m., Saturday 10 a.m. to 5 p.m., and Sunday 12 to 5 p.m. Admission: $7 to $10, $5 students and seniors, $2 kids, $2 on Thursdays from 5 to 9 p.m. 473-7720, mag.rochester.edu.